Maria Goodavage blogs for Dogster, an online community and news source, and her blog is called For the Love of Dogs. 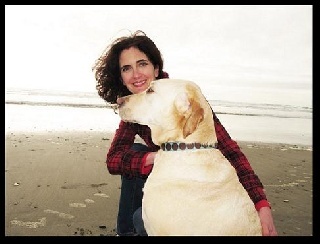 She is the founder of The Dog Lover’s Companion travel guidebook series, and author of The Dog Lover’s Companion to California and The Dog Lover’s Companion to the San Francisco Bay Area. She wrote the first editions of these books years ago, when dogs were barely allowed to set paw in most hotels. She penned the books almost out of necessity, when she was a correspondent for USA Today, and growing tired of sneaking her old Airedale terrier, Joe, into hotels with her when she was on assignment. The award-winning California book has grown to 1,000 pages of fabulously dog-friendly parks, beaches, hotels, bed and breakfasts, wineries, stores, and restaurants (with outdoor tables). “It’s heartening to see how times have changed the attitude toward dogs,” Maria says. Among Maria’s other canine credentials: She co-produced and wrote an award-winning children’s video about dogs and other animals, starring the voice of Ed Asner as Joe the Dog (it’s a great gift for kids 2-6, we hear), and she was the executive producer of The Canine Film Festival in San Francisco — a very successful benefit for PAWS. She is currently the editor of MyWire’s Week’sBest Dogs, bringing together the most interesting dog news of the day. Until she took the post as blogger at Dogster, she was in charge of a bunch of headstrong canines who penned a fun blog called Dog Daily News. Jake is now a middle-aged gent, and is slowly giving up his more youthful habit of chewing utterly everything he can get his mouth around. Now he’s down to the occasional rubber flip-flop when he has company he wants to impress.